Our family tree may have sprouted some long-lost branches going back nearly 2 million years. A famous paleontology family has found fossils that they think confirm their theory that there are two additional pre-human species besides the one that eventually led to modern humans. A team led by Meave Leakey, daughter-in-law of famed scientist Louis Leakey, found facial bones from one creature and jawbones from two others in Kenya. That led the researchers to conclude that man's early ancestor had plenty of human-like company from other species. These wouldn’t be Homo erectus, believed to be our direct ancestor. They would be more like very distant cousins, who when you go back even longer in time, shared an ancient common ancestor, one scientist said. But other experts in human evolution aren’t convinced by what they say is a leap to large conclusions based on limited evidence. It’s the continuation of a long-running squabble in anthropology about the earliest members of our own genus, or class, called Homo — an in­creasingly messy family history. And much of it stems from a controversial discovery that the Leakeys made 40 years ago. In their new findings, the Leakey team says that none of their newest fossil discoveries match erectus, so they had to be from another flat-faced relatively large species with big teeth. The new specimens have “a really distinct profile” and thus they are “something very different,” said Meave Leakey, describing the study published online August 8 in Nature. What these new bones did match was an old fossil that Meave and her husband Richard helped find in 1972 that was baffling. That skull, called 1470, just didn't fit with Homo erectus, the Leakeys contended. They said it was too flat-faced with a non-jutting jaw. They initially said it was well more than 2.5 million years old in a dating mistake that was later seized upon by creationists as evidence against evolution because it indicated how scientists can make dating mistakes. It turned out to be 2 million years old. For the past 40 years, the scientific question has been whether 1470 was a freak mutation of erectus or something new. 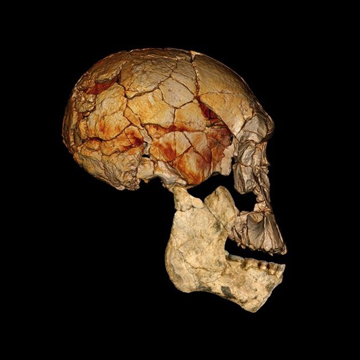 For many years, the Leakeys have maintained that the male skull known as 1470 showed that there were more than one species of ancient hominids, but other scientists said it wasn’t enough proof. The Leakeys’ new discoveries are more evidence that this earlier “enigmatic face” was a separate species, said study co-author Fred Spoor of the Max Planck Institute in Germany. The new bones were found between 2007 and 2009 about six miles away from the old site near the fossil-rich Lake Turkana region, Leakey said. So that would make two species — erectus and the one represented by 1470. But it’s not that simple. The Leakey scientific team contends that other fossils of old hominids — not those cited in their new study — don't seem to match either erectus or 1470. They argue that the other fossils seem to have smaller heads and not just because they are female. For that reason, the Leakeys believe there were three living Homo species between 1.8 million and 2 million years ago. They would be Homo erectus, the 1470 species, and a third branch. “Human evolution is clearly not the straight line that it once was,” Spoor said. And making matters somewhat more confusing, the Leakeys and Spoor refused to give names to the two non-erectus species or attach them to some of the other Homo species names that are in scientific literature but still disputed. That’s because of confusion about what species belongs where, Anton said. Two likely possibilities are Homo rudolfensis —which is where 1470 and its kin seem to belong — and Homo habilis, where the other non-erectus belong, Anton said. The team said the new fossils mean scientists can reclassify those categorized as non-erectus species and confirm the earlier but disputed Leakey claim. But Tim White, a prominent evolutionary biologist at the University of California Berkeley, just isn’t buying this new species idea, nor is Milford Wolpoff, a longtime professor of anthropology at the University of Michigan. They said the Leakeys are making too big a jump from too little evidence. White said it’s similar to someone looking at the jaw of a female gymnast in the Olympics, the jaw of a male shot-putter, ignoring the faces in the crowd and deciding the shot-putter and gymnast have to be a different species. Eric Delson, a paleoanthropology professor at Lehman College in New York, said he buys the Leakeys’ study, but added: “There’s no question that it's not definite.” He said it won’t convince doubters until fossils of both sexes of both non- erectus species are found. “It’s a messy time period,” Delson said.